New book, 192 page. 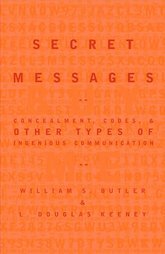 From the fall of troy to intestellar messages by way of the Underground Railroad and Captain Midnight, this book is a collection of 95 of the most interesting examples of code and concealed communications throughout history. The authors have compiled a fascinating array of encrypted communications from a varied field. Many of these examples are from times of war, others are more lighthearted, such as the creative use of hand signals in baseball, and some selections offer a glimpes into how codes are used in everyday life, unbeknownst to most of us, in places like hospitals, police stations, and firehouses. The book also explores the future of cryptography, where technology will enable vast amounts of information to be hidden in miniscule hosts such as human DNA, or the dot of an 'i'.